the aim is to reintegrate them with whatever remains of their families, and while these are being traced, get them back to school. School is one of the best ways to keep the children off the street, as well as equip them for life. Primary school fees are £12 and secondary school fees are £60 p.a per pupil at the time of writing. You can donate here. In the picture above children pose in the classroom with teacher and administrator Meya Mbulo. Meya has dedicated her life to street children. No one who has seen her in action with the children on the streets of Kitwe can doubt her compassion, dedication and courage. Through thick and thin, and there have been some very thin times, she has soldiered on. Help Meya to help these children. Please donate here. If you would like news of Meya’s work and how the children she cares for are progressing please fill in the form below. ” I walk more than 6 kms to school and back. It is great excercise but sometimes I get too tired”, says Kunda Benson. When he was very young, five years old, both Kunda’s parents died and he ended up homeless, living on the streets from 1999 to 2002. He was taken into care by Friends of Street Children in Kitwe (FSC). 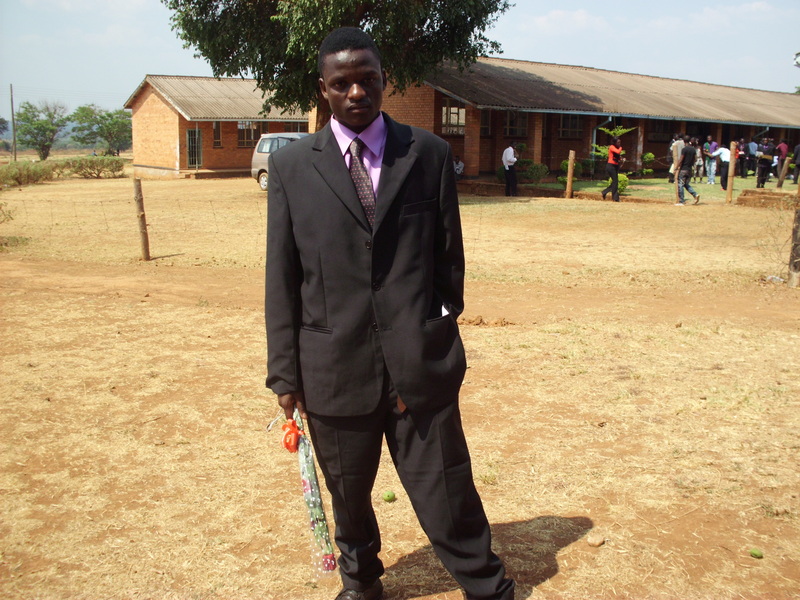 Kunda had the imagination to see that it was worth going back to school, which, with FSC’s help, he did. He had the character and determination to pass his exams year after year, while also helping at the FSC shelter. He succeeded in passing the exams to take a place on a teacher training course. Now he will be taking his final exams in April, which will enable him to start his teaching practice. Kunda has always wanted to give something back and still helps at the FSC shelter. Thanks to the donors and supporters of Romilly, the college fees of this exceptional young man have been paid for the last three years. Thank you all. Kunda writes, ‘I am so thankful for everything that you are doing for me and I am deeply humbled’. Kunda Benson ex Street Child, and, thanks to Romilly’s generous supporters, Trainee Teacher. Keen to learn. Ex-street children with a foot on the academic ladder. These boys were street children. Not anymore. They’ve worked hard at the Naivasha Children’s Shelter to pass their KPCE exams and are now going to high school. Street children don’t go to school. Unfortunately like many in Africa the Kenyan government does not pay for school fees above a certain age. One of the best ways of making sure that a child or young person does not end up on the street is to make sure that he or she is able to go to school. This is why we are so pleased to be able to pay for a years school fees for these 6 boys (only five in the picture). For that thanks to all Romilly’s kind, generous donors. Good work. Thank you Julius for taking the picture and Kristen for sending it. We hope that we will have more news about these boys and how they get on at high school. We are also grateful to Romilly’s supporters for enabling her charity to pay a years salary for a social worker at the shelter. The Friends of the Street Children in Kitwe. Christopher Mulenga, the executive chairman and our interlocuter, has had malaria and has been out of contact. Having recovered from his malaria his internet went down but I am hoping to have news from him soon. Philemon Chilufya is not a street child. This is his home. 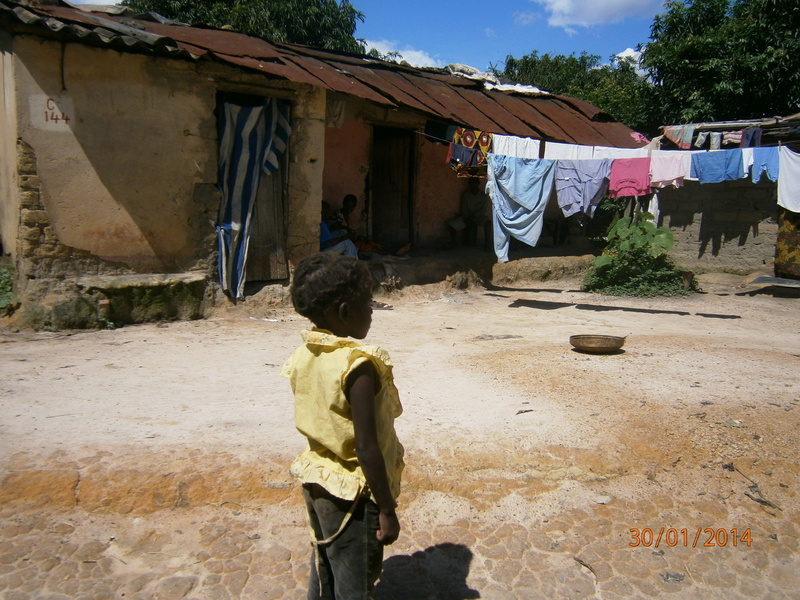 This is the house where his mother Mrs Chilufya looks after Philemon, his two sisters and their children. She is a widow. Readers of this blog will remember that her husband, Philemon’s father, a security guard, was murdered in July 2012 while on duty at the Friends of Street Children site where Romilly’s donors had paid for the construction of two dormitories. Since her husband’s death life has not been easy for Mrs Chilufya and her family. Christopher Mulenga of Friends of the Street children tells me, that they live in ‘abject poverty’. Now she is unable to find £170 to pay for Philemon’s school fees and uniform. Philemon has done well at school and passed his exams to move up into Year 10, but the Zambian government does not provide free schooling after Year 7. Thanks to his gallant mother Philemon is not a street child, and keeping a child at school is one of the best ways of making sure that he (0r she) does not become one. The trustees of Romilly’s charity will be sending the money for Philemon’s school fees and uniform, as well as £360 to repair the minibus generously paid for by Romilly’s donors. If you would like to help Romilly to give street children a chance click on the button below to donate. 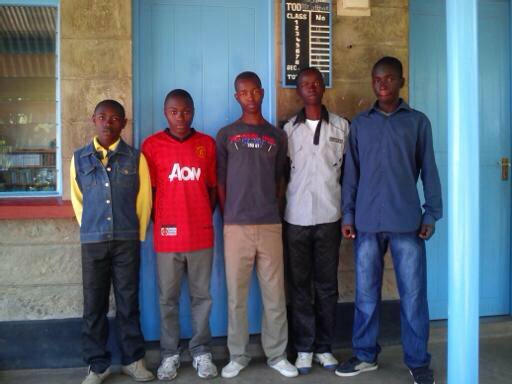 ‘Six of our KCPE candidates (boys who completed class 7) have secured a place in secondary school! This is a huge achievement, and shows not only the dedication and talent of our boys, but also of the teachers, staff and donors who have invested in them throughout the years. I’d like to introduce you to one of the boys, James. 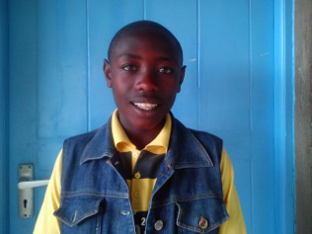 James is 14, and has been at the shelter for three years, since he was left at a bus stop in Naivasha town. He did exceptionally well in his exam, and wants to be a neurosurgeon when he grows up. He also enjoys art, and recently drew a picture of a man with a book for a face (what he imagined when he heard the term “Facebook”). He is very excited about attending high school, and says that he will study hard to realize his dreams. Kristen, thank you for sending this. Good work, James (14). From streetchild to neurosurgeon, that is a tremendous ambition. Thank you, all you generous Romilly supporters for helping to give James this chance. 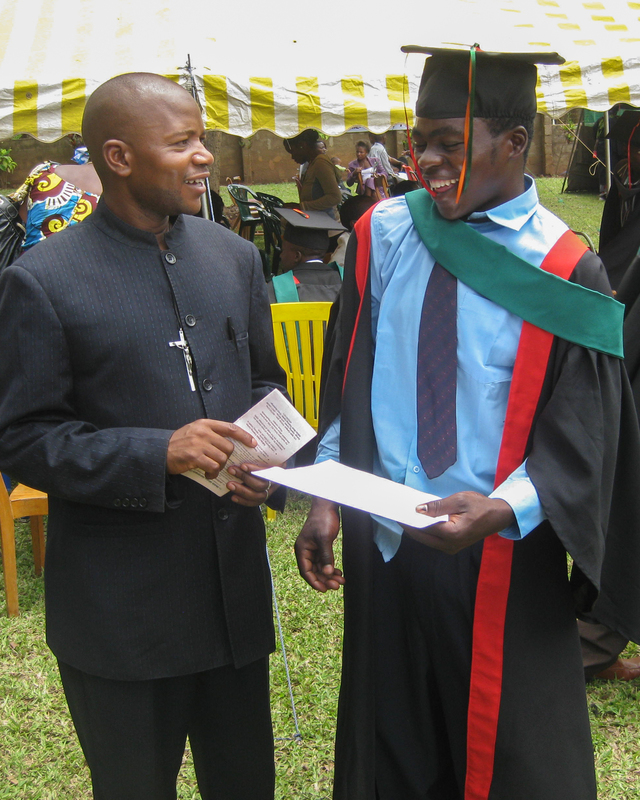 Christopher Mulenga of Friends of the Street Children has sent me this photograph of Zacharia graduating. Zacharia came to the street in 1999 when he was 9 years old. According to Christopher, his parents were drunks and did not care about him. He started attending the open air street corner classes provided by Friends of Street Children (FOSC), and then went into one of FOSC’s residential homes. After a few weeks he ran away. FOSC did not lose contact with Zacharia, and found him a place at a local school where he studied construction and carpentry. He graduated and was given a set of carpentry tools, which he sold a few days later in order to pay for food. Zac ended up on the streets again, but he kept in touch with FOSC. When he was 16 FOSC found him a place at another school. They paid for his accommodation and fees, and once he graduated helped him find work. He is now employed on a building site as a roofer. Help fund FOSC and the excellent work they do by buying tickets to FASCINATING AIDA’S concert for street children. Only 6 days to go. Still a few tickets left. Tickets £40. Includes white wine and smoked salmon. Christopher Mulenga of Friends of Street Children (FOSC) in Kitwe, Zambia has sent me this picture of Mateo, graduating from Chiwala High School. Mateo arrived on the streets, an orphan, at the age of 7 in 1999. This was at the time of conflict in Zaire just across the border. Neither his origins nor the burial place of his parents were ever discovered, though a family in a nearby town claimed him as a relative. This did not stop Mateo ending up back on the street again. Later he was befriended by an old man. He too dumped Mateo on the street. Very early on in his street life Mateo attended the open air street corner classes run by FOSC. Later FOSC took him into one of their homes and sponsored him through school. Mateo worked hard and has graduated from high school. His ambition is to become a lawyer and a role model for those that find themselves in the same position as he did when he was 7. Help support FOSC and the good work they do. Come to Romilly’s Concert, where Fascinating Aida and Massive Violins will be performing, 3rd December, Westbourne Grove, W11. Tickets from Tim and Lizzie Drake 0208 994 8544. Apart from the salary of her now dead husband the widow of the security guard had no other income. Her outlook without her husband’s salary would be bleak and she would be unable to continue sending their youngest son, Philomon, aged 16, to school. The cost of sending him to school is K985,000 which is about £130 pounds per annum. Romilly will provide this until he leaves school. Christopher Mulenga of FOSC, which runs the rehabilitation centre, says that with a small grant or loan of £164 Mrs Chilufya would be able to start a business, and provided that this is what she wants to do, Romilly will provide the £164. Thank you very much to Romilly’s supporters for making this possible.